Dear Guest, this EA MT4 version was developed to open alternately short (scalps) buy and sell positions, having no relation with indicators or timeframes. Therefore only one installation will be ineffective, although there is only relevant history of gains with a running unit. Given that a backtest does not simulate the performance of several robots at the same time, I created this group with the intention of finding the 200 best configurations possible so that acting together and synchronously produce great possibilities of profit. 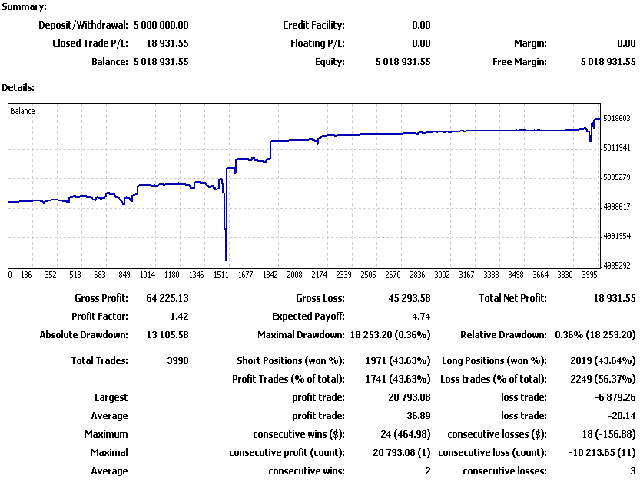 It works with the option "Martingale" total or partial and also with addition of lots with each loss. The success of this robot is based on the high volatility of the markets (because it executes in a way that humanly could not be done) when the market consolidates there will be low performance, even with possibilities of losses. So it will be important to know how to set the best hours of operation for the day, I already have significant advances, such as the best pairs to install it are GBPUSD in its first hours of market. For USDJPY the important thing is to analyze the days when there will be great volatility in the market.